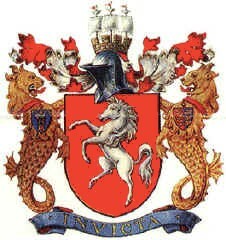 The white horse of Kent appears on the burgees and ensigns of the Medway Cruising Club and the Medway Yacht Club. At http://www.doverport.co.uk/index.asp is a logo of this port that looks like a flag - white-blue-white (1:4:2) with canton half way with three boats. The canton is the arms of the Cinque Ports: per pale gules and azure three lions passant guardant dimidiated and conjoined to the hulks of as many ancient ships all in pale or. Dover was one of the principal members of the Cinque Ports organisation (something similar to the German Hansa towns, although not as powerful). Dover Council does not fly a flag of its own.